STRONG, GEORGE TEMPLETON. [1835–1875] Lawyer from a privileged New York family. 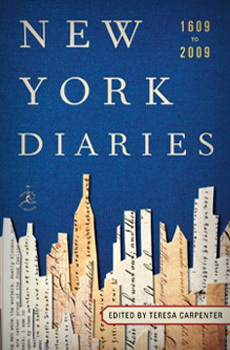 A conscientious diarist who chronicled the American Civil War, among other events, for posterity: impressions of the nascent Central Park and Metropolitan Museum of Art. Strong offers opinions on wide- ranging subjects: Jenny Lind; the moral degeneracy of Wall Street; contempt for European royalty; and an abiding hatred of anarchists. Manuscript owned by the New-York Historical Society and available on microfilm at The Metropolitan Museum of Art’s Thomas J Watson’s Library. Diary published as a four-volume set edited by Allan Nevins and Milton Halsey Thomas for the Macmillan Company, New York, 1952.